This was a smaller contest than previous due to severe snow on the day and the two days before. We had 25 pipers initially on the list and on the day 13 appeared. Those included pipers from the USA, Germany, and the frozen West of Scotland. A lot of effort was made to attend in these difficult circumstances – so thanks go to all of them, and to audience members and supporters. The weather also prevented the attendance of both judges (Patricia Henderson and Donald MacPhee) but fortunately Alan Forbes – a Senior judge with 35 years’ experience – was present. He asked myself (as convener) to assist him, which I did in small part. 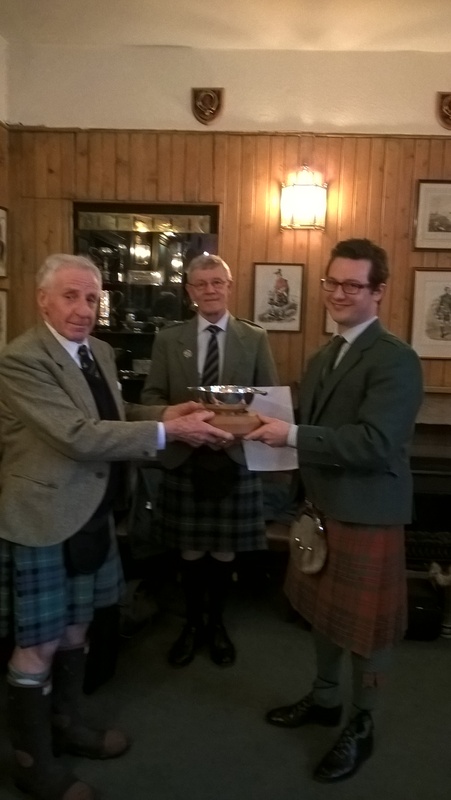 Winner Robert Wilson receives the Archie Kenneth Quaich from Dugald .MacNeill. Alan Forbes looks on. The winner was Robert Wilson playing MacCrimmon’s Sweetheart.